Walking down the aisle and standing at the altar. I didn’t even look out at our guests! It was a really special moment between the two of us. The dance party and photo booth! 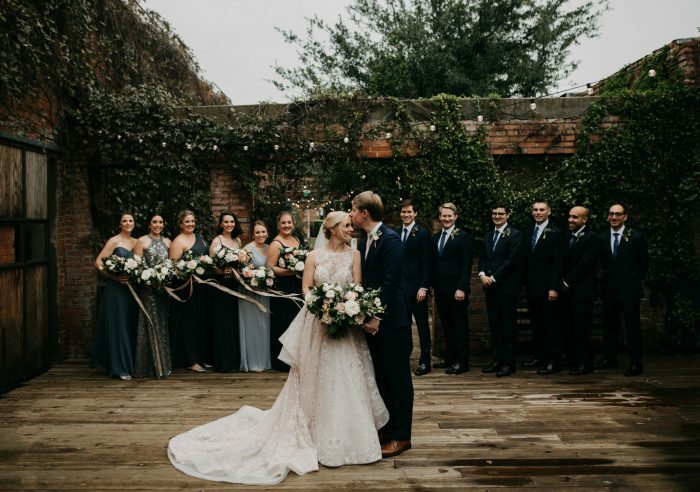 Aside from the 2 hurricanes that hit on the wedding weekend (one on the east coast where many of our guests were flying from and one in Dallas where we were getting married!) there were no real surprises. Thomas and I are not religious, but both of our parents are. We didn’t want a ceremony that was just reading from the prayer book as we felt that the language wasn’t as applicable to our lives. We therefore asked both a good friend who is a relationship counselor to marry us, but we also asked my dad’s old next door neighbor and former bishop to assist. He took care of all the religious stuff, but our vows were very simple and based upon the science of what makes a good relationship. The bishop also married my grandmother to my step grandfather in the 80s, so wasn’t his first family wedding! We had a few touches of personalization. Our wine bottles were done through a vineyard in Sonoma that does personalized wine labels so we used our engagement photos on the wine bottles. 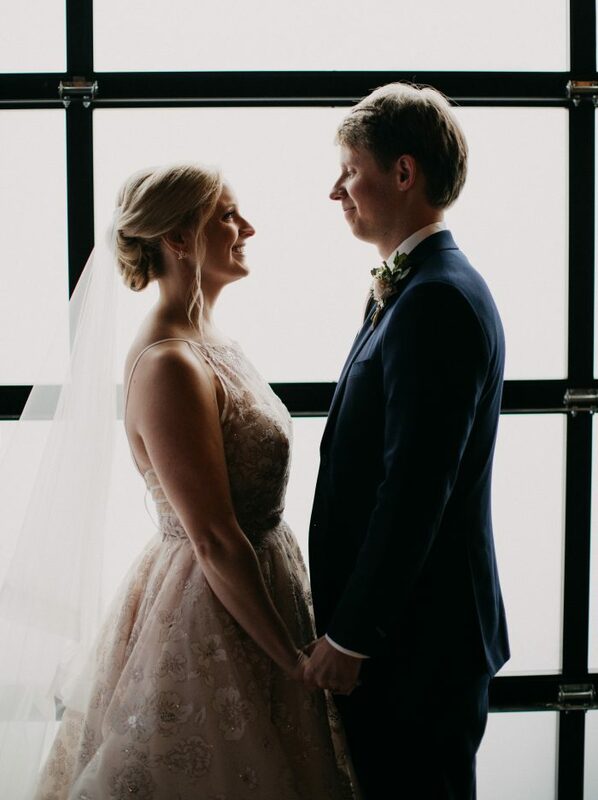 Our drinks were our favorite drinks – his was a Manhattan (also how we celebrated our engagement, and we used my dad’s famous secret recipe. My dad spent months perfecting the cherries!) and the bride’s drink was a can of rose in a koozie that had both New York and Texas on it. We love to travel, so our table numbers were places that we had been together (ie Old San Juan, Lofoten Islands, Berner Oberland). And finally, we absolutely love breakfast tacos – hands down our favorite food. So we had a taco truck that served breakfast tacos at the end of the night. Tanzania! We are very adventurous travelers – our first trip together was a roadtrip through the Balkans. We wanted to do a traditional honeymoon, but a little off the beaten path, but still luxury. A friend told us about the Wildebeest migration that occurs in the Serengeti every year – the wildbeests are in the Northern Serengeti in October with their new babies. He hooked us in with a tourism company on the ground in Africa that specializes in moving camps. We had a great time! One of our camps was visited by lions one night! Cake tasting, menu tasting, and wedding dress shopping! Hands down. We are excited to just take some time alone together. Well, also with our pup. 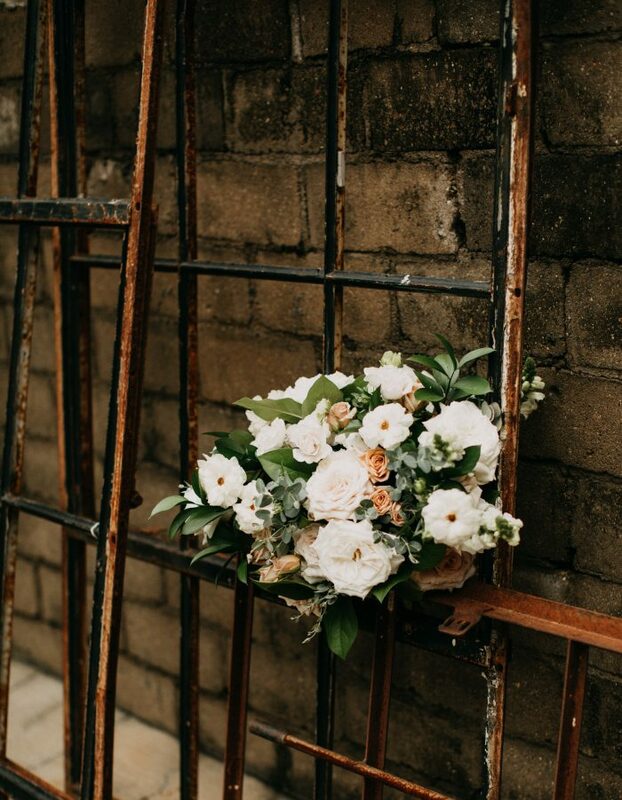 The wedding planning process was hectic, and it involved so many unwarranted family opinions and expectations. It’s nice to just spend time together again. We met in NYC on a blind date – he went to Dartmouth College with a friend of mine from Columbia University School of Nursing. Our first date was solid, good wine and good conversation, but we had both been on so many dates by this point that we weren’t super invested. 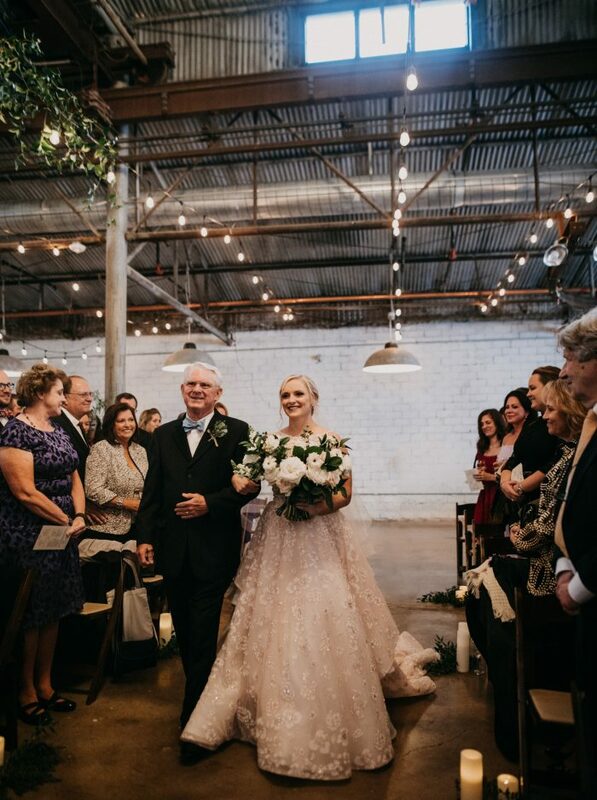 Over time we got to know each other better, and after 3.5 years together (and the adoption of an adorable puppy) we got married on October 13, 2018. Our wedding party was made up of our best friends. In my party was my two best childhood friends (Chandler and Sarah W.), my best friend and former roommate in NYC (Sarah T), my two other former roommates that now live in California and Minneapolis (Katie and Michon) and the person who set Thomas and me up on our first date! Thomas had his twin brothers, his best friend from childhood, his two best friends from college from one group of friends, and his best friend from another group of friends. Everyone looked great! 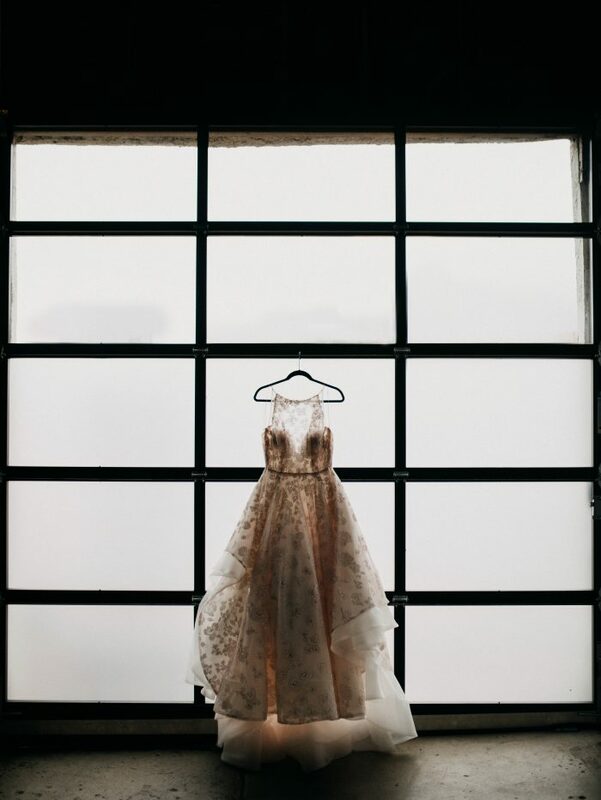 I used Brideside to help me pick mix and match dresses – I wanted dresses that didn’t break the bank, but also were dresses that my bridesmaids were excited to wear. I also wanted to mix textures and colors. Thomas wanted to wear navy suits as most young men have a navy suit already in their closet. He worked with a stylist in NYC to pick the ties and the accents. I think it turned out great! My dress was Hayley Paige Reagan dress. I felt I was too pale to pull off a fully white dress, so I went with a blush option. Real talk: I picked this dress because it made my waist look tiny, and I also didn’t want to be in something that was the standard dress. I didn’t want a strapless dress either. This was playful and fun. My only regret was that it was very difficult to pee in without assistance. 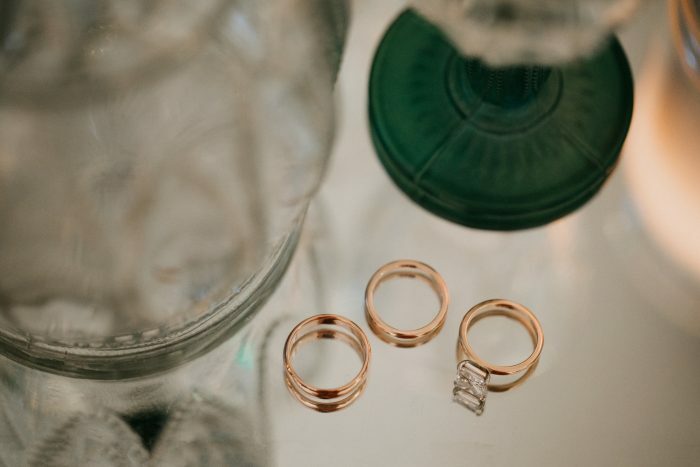 Pictured are my rings that I wore during the ceremony – I wore my engagement ring, received my wedding ring, and I wore my grandmother’s sapphire engagement ring as my something borrowed, blue, and old. I chose a band that was very plain for my wedding band for two reasons: 1- I am a nurse practitioner so I wanted a plain band that I could wear at work. I also wanted the engagement ring to be shown off as it is still my favorite piece of jewelry. I didn’t want to detract from it. Thomas got a plain rose gold band as well. This photo was taken during the ceremony, with both the bishop and Morgan (our officiants) taking turns with the mic. We chose our venue at The 4 Eleven because neither of us are terribly religious. 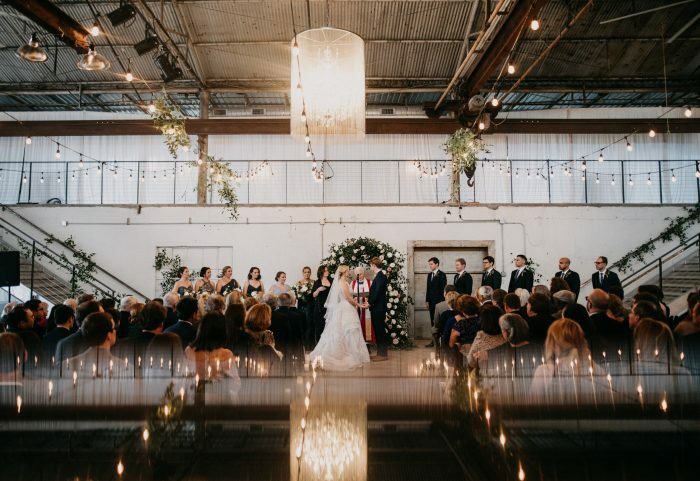 We wanted the venue to feel a little different than the average Fort Worth wedding. We didn’t feel the need to have the constraints of the church, and we wanted a big open space with high ceilings. We also thought about doing it outdoors, but weather is too unpredictable in Texas! This was my bouquet. The flowers were incredible, including the altar flowers in front of which we were married! Those later served as the flowers to decorate the cake table. Thomas and I missed our cocktail hour – we had some cocktails by ourselves. Well, ourselves and the 3 women it took to bustle my dress. It was storming up until an hour before our ceremony so we enacted our rain plan which involved draping the top floor of the reception area and hosting the cocktail up there instead of the courtyard. 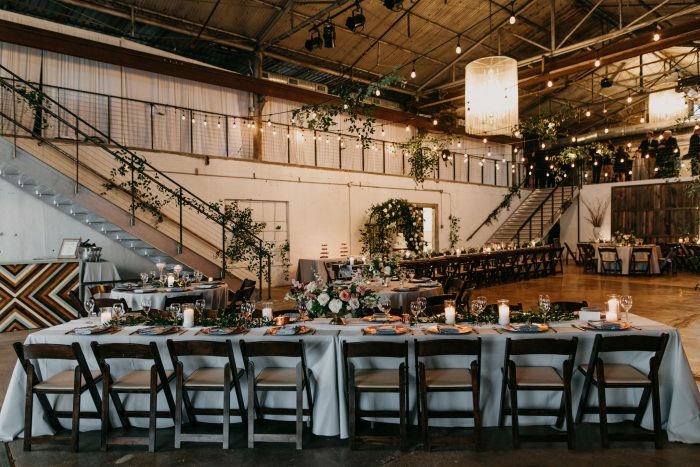 Our reception space was the same space in which we got married which took a team of people to “flip” between ceremony and reception. It turned out great! We mixed and matched with round and farm tables for dinner which made the space feel more interesting. My favorite moment from the wedding was walking in with my dad and seeing Thomas at the altar. He looked so happy. I didn’t look at anyone in the audience, I just kept eye contact with Thomas and was smiling ear to ear! Thomas cried… a lot. This is the last photo of the night when we got in the getaway car. We both love this photo of us driving off into the night in my godfather’s 1965 mustang convertible. Also, we were both very excited about eating breakfast tacos immediately post photo.